In this project, Wendolyn Hill illustrates one of the ways proposed to manage Lyme disease and other tick-born diseases. The White Footed Mouse is a primary vector in the first year of the tick’s life. An affective tick-born disease preventative would be to apply poison to kill the tick as it feeds on the mouse. 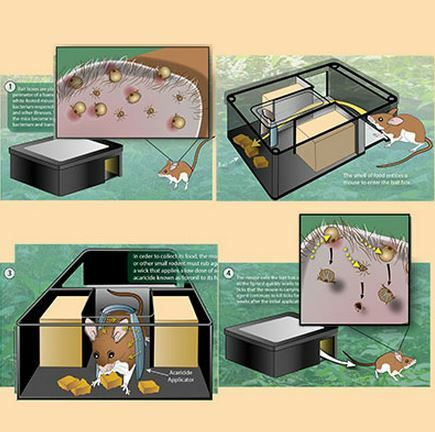 This system lures the mouse into the trap with bait. As the mouse reaches the bait, it brushes against a wick which applies an aracide which stays on the mouse for several months. See more work from Wendolyn Hill through her MISB portfolio and website.